Nike’s new basketball jerseys as part of its partnership with the NBA are about to get the most epic of co-signs. According to py_rates, NikeLab will team up with none other than Supreme to release three NBA jerseys, each priced at $325. Based on the information provided, the colors appear to align with the Nike Air Force 1 Mid collaborations that were reported last week. 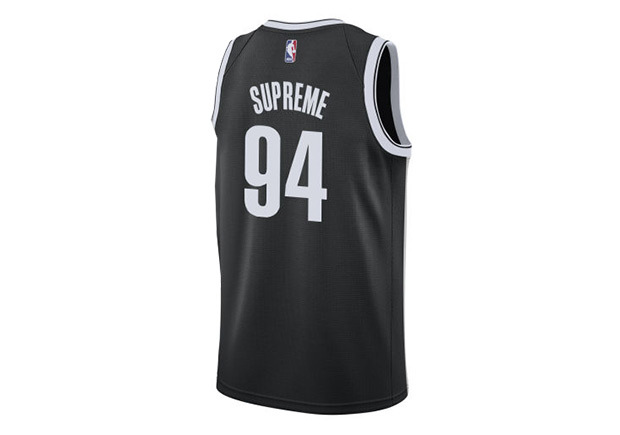 Given that Supreme has an affinity for sports jerseys, don’t be surprised if “94” is the number used on the front and back. We already know a Supreme shooting sleeve is coming, but what else could the streetwear mega-brand have in store to complete the on court look? The above photo is a rendering and not an actual portrayal of the product.